The way Miracle Rogues function is by using a term called cycling cards, which relies heavily on the card drawing mechanics. Cycling is when you play a card and it drew you another card, thus not losing value. There are two roles which each card in the deck may play. The first possible role is to delay. Every card which draws other cards serves this purpose. The second role is damage dealing cards, which is used to kill your opponent. 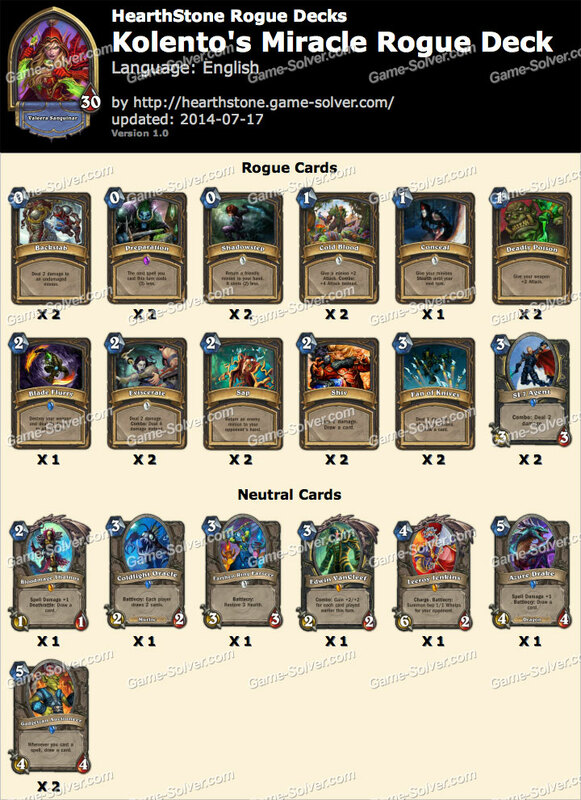 Try to play this deck to control the early game without using up too many damage dealing cards. Backstab – This is the main combo tool which will allow you to stay alive in the early game and can be cycle cards with the help of Gadgetzan Auctioneer. Preparation – Rather useless in the early game, with some exceptions, when you need to combo something. Usually will be used as a combo starter and at the same time cycle cards with Gadgetzan Auctioneer on the board. Cold Blood – This is a nice tool, which serves the damage dealing role in this deck almost all time. Conceal – Run one of these, because there are so many minions on the board which require stealth. Deadly Poison – This can be either used as a survival tool in the early game to clean enemy minions, or as damage dealing card. This card combos well with Blade Flurry as well. Blade Flurry – This is a strong AoE which may be used in any stage of the game. Eviscerate – This card can be either a finisher or removal. Sap – This mid to late game card can sometimes be used to kill an opponent by removing a strong taunt, but usually role of this card is to delay the game by temporarily removing huge minions from the board. Shiv – This card works extremely well with Gadgetzan Auctioneer on the board. Fan of Knives – A key survival tool, this card has really strong synergy with the Bloodmage Thalnos and can be used with Preparation as a zero cost Arcane Explosion. SI:7 Agent – This minion can mostly be used to deal with early game pressure, and, with the help of Shadowstep becomes a 1 mana Backstab. Bloodmage Thalnos – Increased spell power from Bloodmage Thalnos can be really strong, because of how heavy this deck is on spell damage. Earthen Ring Farseer – Quite decent 3/3 minion that costs 3 mana. But the healing is exceptionally good especially when you are against aggro decks. Edwin VanCleef – He is our miracle, and he can be really big, but don’t be too greedy and not play him in the early game. Remember, even as a 4/4, he can be really strong. Leeroy Jenkins – This is our main damage dealing minion, and can be synergized with Shadowstep and Cold Blood to deal incredible damage. Azure Drake – This card is too good to be true. It helps with cycling cards and gives increased spell power. Gadgetzan Auctioneer – This minion is a key component of this deck. There are six spells which cost 0 mana and five which cost 1 mana. These can be easily cycled with some benefit with the help of Gadgetzan Auctioneer and Preparation can perform miracles with the help of this minion.